Planning a family holiday to a safari lodge in Limpopo is one of best ways to spend some quality time with your children and spouse. 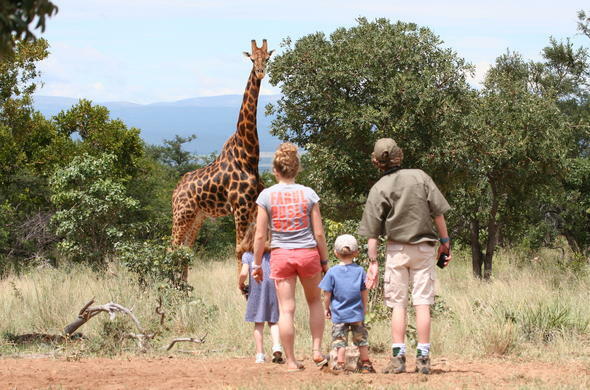 Here is a list of our top lodge for a family friendly safari getaway. There are a number of safari lodges in the Limpopo area that specialise in creating family friendly safaris, ideal for you and your family. Conveniently situated just a short drive from Johannesburg, the Limpopo Province of South Africa has a number of safari options for you to choose from.Of the most memorable and life enhancing family holidays that a child can go on, a safari vacation has to rank as one of the best. To be out in the wild, surrounding by the African bush and the wide variety of African wildlife is a wonderfully engaging experience for both young and old and is an experience you and your family are guaranteed to look back on in years to come with both happy and fond memories.Many luxury safari lodges do not allow children below the age of 16 to stay, while other lodges specialise in child friendly safari experiences, offering specialised game drives for the little ones as well as babysitters and even special activities such as junior ranger training courses or kids clubs where the children are taught safari survival skills and get to take part in a number of special bush activities. But which safari lodges offer the best, most family friendly experiences? Here is a list of our favourite family-friendly safari lodges in the Limpopo area. Located in the Waterberg area of the Limpopo Province, Ants Nest offers personal service and unerring flexibility to ensure your safari holiday is everything you desire. The relaxed atmosphere is ideal for children and the family cottage offers two main bedrooms with en-suite bathrooms as well as a loft area which is ideal for small children to sleep in. The private lounge area and verandah provides ample space for the family to spend time together while taking in the spectacular views.Horseback safaris, with small ponies for the little ones, guided game drives and guided game viewing walks all geared towards both adults and children, allowing parents to witness their children's first encounters with wildlife. For children under the age of 4, are too young to take part in some of the activities available, there is an abundance of activities at the lodge to keep them entertained including sand pits, trampolines, toys, books and a heated swimming pool. Makalali Game Lodge is situated in a private game reserve in the Limpopo Province on the banks of the Makhutsi River and offers 4 exclusive safari camps each consisting of 6 luxury suites.Children of all ages are welcome at Makalali and all 4 camps offer mini ranger programmes where children ages between 6 and 12 can learn about their surrounding environment, graduating at the end of their stay with a personalised certificate.Aside from the mini-ranger programme there is an array of other interesting activities to keep the children entertained. The lodge also offers baby-sitting facilities if parents want to spend a little bit of quality time together. A 5 star luxury safari lodge located just 3 hours from Johannesburg in the Waterberg area of Limpopo, Jembisa is the ideal safari lodge for a family or group of families looking for exclusive use of a lodge in a malaria free environment.Accommodating up to 14 people, Jembisa offers exclusive use of the luxurious, informal accommodation and facilities, giving guests the freedom to explore the reserve and stay in the lodge all on their own. Friendly and enthusiastic staff members are on call at all times to ensure that visitors' every need is seen to.5 beautifully appointed rooms are available for adults and older children while the children's bunk room is the ideal space for all the children to play in and sleep in. Tailor-made safari activities are carefully arranged to ensure the children all have a wonderful time, learning about the bush in a safe and happy environment. Hidden away in the 22 000 hectare Entabeni Game Reserve in the Limpopo Province, Lakeside Game Lodge offers luxurious family friendly accommodation in a malaria-free setting on the banks of the Entabeni Lake.Elegant and luxurious, Lakeside Lodge offers 24 rooms and 9 magnificent appointed family rooms each with their own en-suite bathrooms. Aside from a range of game viewing activities, visitors can also enjoy a sunset cruise on the lake.